In the water-related field, we undertake wastewater traceability and supply studies in order to identify optimal purification processes to ensure an appropriate quality for its intended use or in line with current legally established discharge quality requirements. Likewise, we develop advanced biological and physical-chemical treatment systems for water reuse technologies and undertake assessments of natural attenuation in polluted groundwater. We characterise membranes and develop their application as separation technology in the fields of industry and water treatment. We study the viability of their application and the optimisation of their performance (design, operation, fouling and cleaning). We also apply advanced treatment methods such as advanced oxidation, RMB, SBR, electrocoagulation, etc. 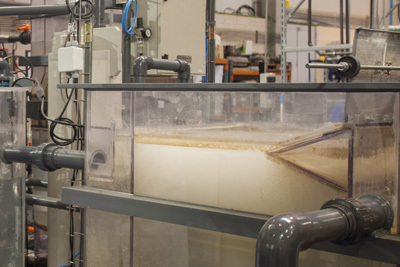 Additivation of process waters (biocides). Conventional separation/destruction systems (coagulation-flocculation, flotation, absorption on activated carbon, evaporation, stripping, etc.). Hybrid treatments: membrane bioreactors - MBR.